FnS Stainless Steel cutlery is durable, environment-friendly, preserves flavor and besides magnificent looking, it is easy to clean! >You must always pre-clean the cutlery before loading it in the dishwashers. Use a dish liquid and hot water to do so. This will get rid of the leftover food particles and acids in the easy places. >When using a dishwasher make sure the handles of spoons and forks face down and the knives face up and spread out the cutlery so that no two articles get clogged together which could make it harder to clean. >Always hand dry washed cutlery immediately after. Remove any heat streaks or dry patches by cleaning with a soft paper towel damped with olive oil. This will also add polish to it. >Apart from the routine cleanup, hardened stains or build-up can be gotten rid of by spot treatment. Prepare a cleaning solution by adding baking soda to dish liquid and use it to clean your cutlery periodically. Like all things in the mortal world, cutlery tends to lose its lustre over time as well. 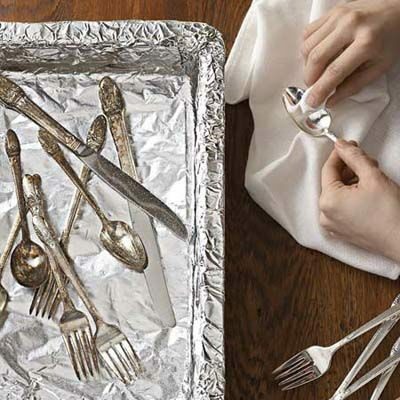 You could buff your cutlery either with polish or lemon oil to make it shine like new. Always polish keeping in the direction of the grain of the steel. Previous Previous post: THIS MONSOON, PEEL AWAY YOUR PRE-COOKING BLUES!